When Nintendo had broadcast their Nindies Showcase Spring 2018 presentation back in May, there was not just one, but two side-scrolling indie adventures starring a lead ninja protagonist. The first was the excellent, time-swapping Ninja Gaiden-esque adventure The Messenger, and, of course, Mark of the Ninja Remastered – a remastered port of the original Xbox Live Arcade game. Despite receiving critical praise in its own right, the shadow-dwelling original may have easily passed you by in 2012. It certainly did so for me at least, as I had no idea of its original existence before Nintendo had spotlighted it earlier this year. For many new players like myself, Mark of the Ninja Remastered probably won’t feel like much of a remaster at all. There’s a few quality of life improvements such as improved audio and visual upgrades, along with the small amount of downloadable content that was released to support the game back in the day. What does make this particular version special though, is that, for the first time ever, you can now play the game while perched in a tree at nightfall waiting for that bully who used to steal your dinner money to gormlessly wander past. Just remember to bear in mind to make sure that you keep the volume down. Sound is a dead giveaway of your position after all. In this stealth-puzzle adventure, you play solely as an unnamed male ninja etched with a fleshy canvas of badass dragon tattoos. The plot of the story has the lead protagonist heavily burdened with a special responsibility to protect the Hisomu Clan and rescue his sensei, Azai. The burden itself lies within the special power contained in such ink, for it will eventually send the host insane if he doesn’t agree to take his own life once his job is done. This all leads to a lot of sneaking around and the assassination of enemies that even Solid Snake would tip his eye-patch to. 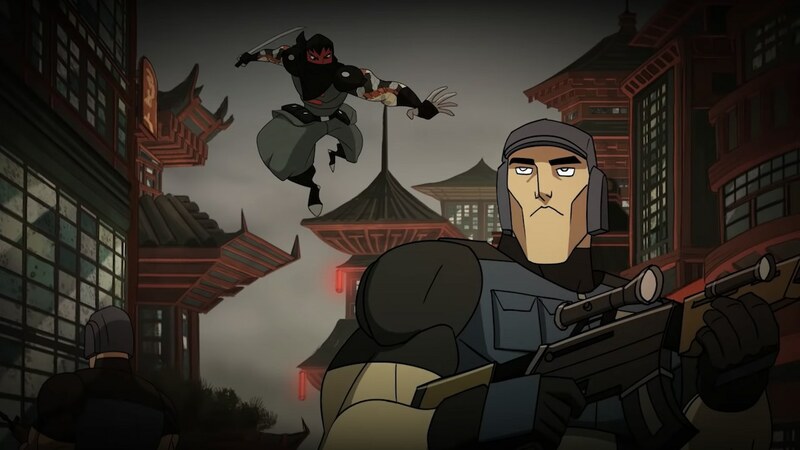 The team down at Klei Entertainment has done a wonderful job at sinking the player into the shoes of what a ninja assassin is traditionally portrayed as. The visual language that bleeds across the screen notifies the player’s hidden presence by displaying any sound and sight reached within a certain radius. For example, running along a rooftop will cause large ripples of sound that will attract a guard’s attention should the ripples activate near them. On the other hand, your ninja can only see his enemies if his line of sight isn’t blocked in some way. One nice little feature, as a result, is the ability to lean against a closed door to “sense” the presence of enemies that may be lurking behind it. The whole concept may not necessarily be an original one, but in two-dimensions, it’s certainly a practical way of expressing the gameplay. Each level has an objective that differs in context, but pretty much has the same outcome nonetheless. You work from A to B trying not to get detected or killed, while assassinating as many goons that stand in the way. Fighting enemies head-on is a bit of a no-no because ninjas seemingly fight back with feather pillows for fists. This is obviously the game’s way of telling you that ninjas deal death from the shadows, which is a good thing really as the gameplay is at its best when you abide by the rules and cautiously plot your way forwards. Despite starting out fairly restricted in abilities, our fated Hisomu ninja can soon upgrade his skill set with cool new moves and tools to aid him on his honourable murder spree. Hidden scrolls and puzzle-based secret tasks will reward you with in-game currency known as Honour to earn such privileges. This makes replaying levels much more approachable to hit certain requirements for those seeking for a bag full of “no kill” bonus points. However, there is a certain mechanic that is obtained a little later in the story that can slightly spoil this whole clever field of view structure. The ability is known as Far Sight and basically makes everything visible like night vision x-ray goggles when activated from a stationary position. It’s ok, and somewhat necessary in some cases I suppose, but it can kill the tension of it all if you come to rely on it. The gameplay can become repetitive as a result of focusing too much on stealth alone. There are some small faster-paced platforming elements found in places like the Catacombs, but not nearly as much as I would have liked to have seen just to break up the formula a bit. That’s not to say that new threats and mechanics don’t get introduced, because they certainly do. It’s just that certain elements can feel vastly overused and almost stale at times – especially when it comes to the overuse of lasers and levers. Another little niggle that I had was how the controls can seem a bit fidgety at times. There would be moments where I could swear that I had inputted the correct actions, or held the correct distance for assassination attacks. Although to be fair, there is a smug, on-screen action button display hub in place to prove me wrong. In any case, for what Mark of the Ninja Remastered sets out to do, it does it impressively well. While I wasn’t too into the whole flash-based cartoon art style, the animated cutscenes and the way the whole visual atmosphere relevantly affects the gameplay works a treat. It’s very easy to understand whether you are exposed under the lights, or hidden within the shadows like a predator seeking prey. It’s a very gory looking game too. Sneak attacks will graphically see the ninja swiftly slice open the jugular of an unsuspected enemy. The good news is that, despite the few personal coordination issues mentioned above, the fluidity of how you navigate the assassin around the levels completely sells the idea of being a weightless ninja. Launching a hook shot towards structures from a wall, then dangling down towards a mark feels as elegant as Spider-Man mixed with the temperament of Batman doing what he does best. Except for the murder bit, of course. Batman doesn’t do murder. Not unless Zack Snyder tells him to at least. Mark of the Ninja Remastered is a great stealth game that fits nicely as a portable time-killer. The gameplay takes every stealth trick from Metal Gear Solid’s book and translates them into two-dimensions wonderfully well. With that said, if stealth isn’t your bag then this game probably won’t be either as the over-reliance on its wonderfully implemented sneak system may feel a bit too repetitive for some. However, mastering a level with an objective in mind did make me feel like the badass ninja that I’ve always wanted to be. Well, besides the fact that I’m now in my mid-30s and dressing all in black with plimsolls on at nighttime while dangling off a Farm Foods signpost is probably universally frowned upon.